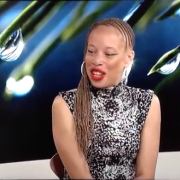 This past month, supermodel and motivational speaker Stacey McKenzie had the opportunity to return to the first school she attended upon arriving to Canada: Lawrence Heights Middle School. As a young girl, Stacey and her family emigrated from Jamaica to Toronto’s Lawrence Heights neighbourhood. Stacey was invited by the school to speak with students as part of her Walk This Way Workshops and to film a very special program airing on CBC this February called ‘Being Black in Canada’ (details below). Stacey’s Walk This Way Workshops focuses on building self-confidence and developing life-skills for inner city youth across the world. When she first arrived at the school, Stacey was greeted with a warm welcome from students, teachers and Principal David deBelle. Overwhelmed with memories (and ecstatic over the homestyle Jamaican cooking in the cafeteria), Stacey soaked in every moment of the experience. Special thanks to the students, staff and particularly Principal David deBelle for making this day happen. To see the excitement for yourself, be sure to watch the special airing this February! “CBC News Network presents ‘Being Black in Canada’. We mark black history month with stories of the challenges that black Canadians face and what they’re doing to overcome the obstacles.